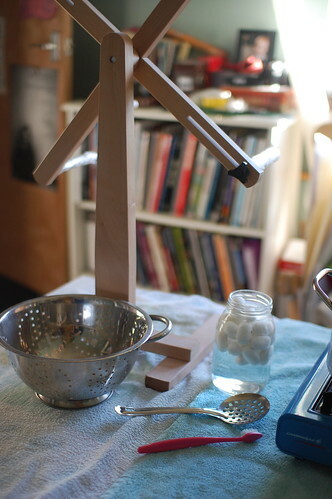 equipment: spoon and colander for moving cocoons about, toothbrush to pick up silk from the outside of the cocoons, skein winder for reeling off thread. 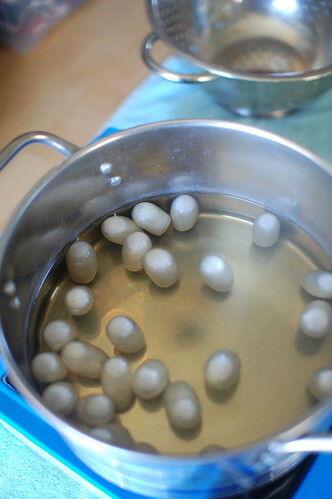 cocoons are pre-soaking in hot tap water. 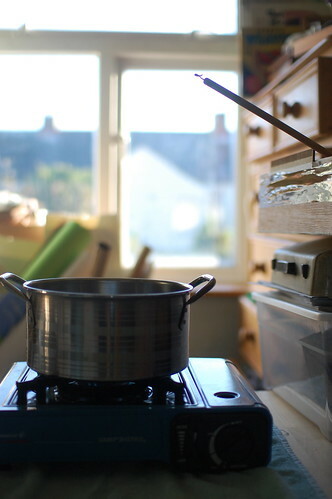 pot and burner, water is kept hot but not simmering. guide hook for gathering threads (i’m using the hook on the end of a drop spindle). 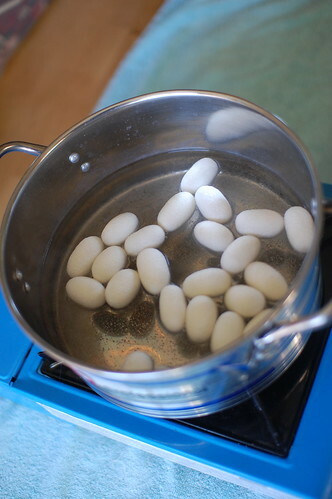 when you first add the cocoons to the pan they float. 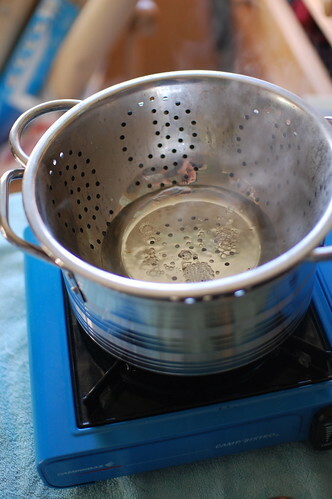 the colander keeps them below the surface so they can soften and take in water, the air from inside bubbles out. they’re ready to reel once they’re semi-submerged like this. then you start fishing around with the toothbrush to catch the loose fibres on the edge of the cocoon. at first you get a net of fibres but as you pull it narrows down to a single thread. the tangled waste discarded in this process can be degummed and spun. this is the most time consuming and frustrating part. the outer silk from where the cocoons were just started is more temperamental than the later thread. if the thread snaps you have to start over with the toothbrush. i used 25 cocoons in this batch. 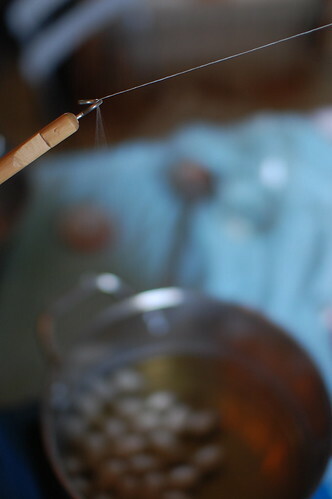 as you gather the threads you run them over the hook, the warmth, wet and natural gum in the cocoons joins them into a single thread. 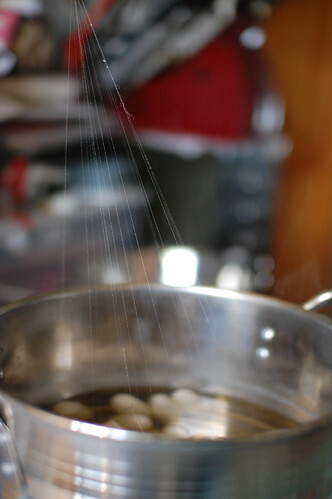 then you wind onto the skeiner, trying to adjust where you lay the thread so wet doesn’t sit on wet and stick together. it turns out this part is really important, thanks to sticky threads i’ve had a nightmare getting it off the skeiner. 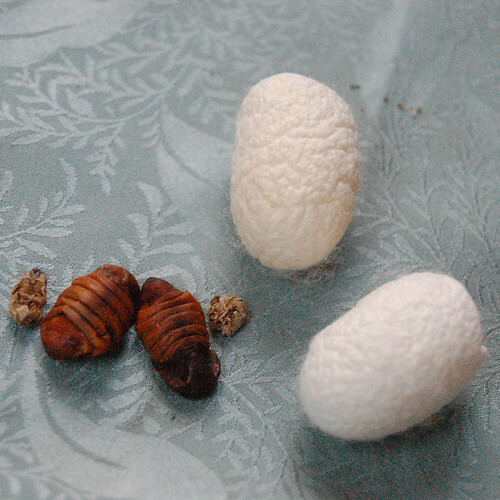 this picture is from my first try and shows the silk from 7 cocoons. i rapidly upped that number to 25 because the thread was far too fine to handle, it kept snapping when i tried to wind it off the skeiner. even the thicker thread is tricky, as the thickness tails off as cocoons are exhausted. in future i’ll wind off the starts and ends and only skein the solid thread from the middle. once the cocoons are firmly attached there’s much less breakage and you can wind off the centre portions impressively quickly. i had to cut my first sample off the skeiner, but i need continuous lengths to weave (unless i cut the threads into spinnable lengths of about 6 inches, degum, card and spin, which kind of negates the point of reeling single threads in the first place). my plan is to wind off long sections that i can then ply together into fine yarn strong enough for warping my little loom. 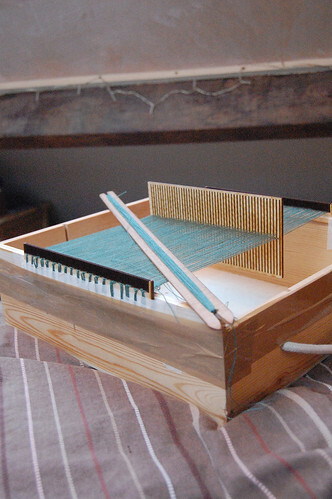 i wanted a small sampling loom, following the pattern of this cardboard box loom. 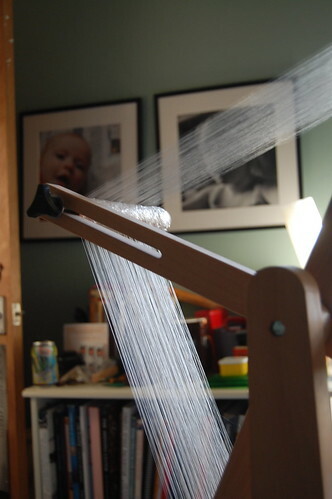 it’s a simple rigid heddle set up producing a plain weave cloth (one over, one under). but i wanted it to weave fine yarn, much finer than i could have achieved making one by hand. 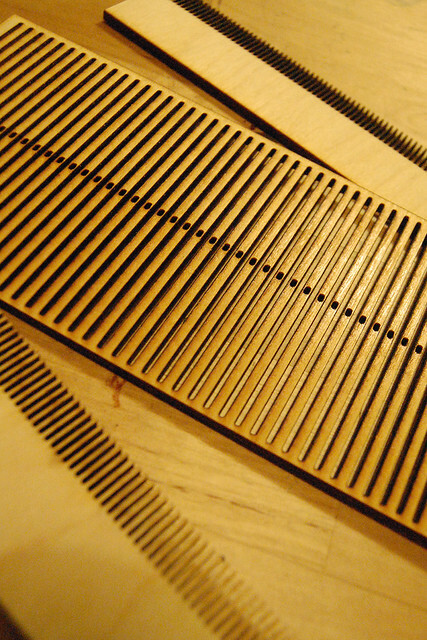 the laser cutter did a brilliant job. i used 3mm ply which looks as though it will hold up if i don’t warp it too tightly. 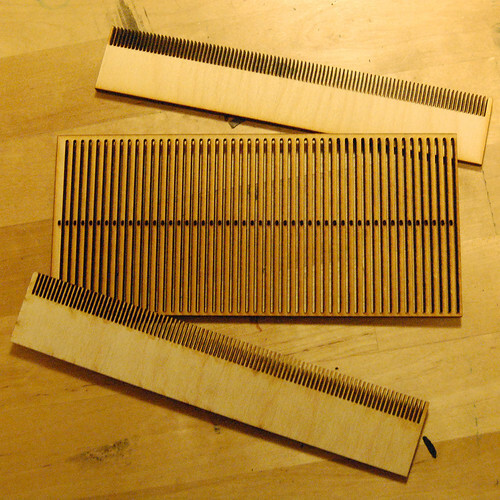 i made two end pieces to wrap the warp ends around and a reed/heddle with eyes/slots 1mm across and 1mm apart (which amounts to just over 12.5 dpi, which is the closest commercially available reed). depending on the thickness of the yarn i might have to sley multiple ends per hole/slot. after testing i might cut a long shuttle which i can also use to beat the warp. beautiful silver work with a twist.